St. Mark offers weekly Adoration in the St. Mark Chapel on Fridays following the 7:30 am Mass and ending at 11:30 am. 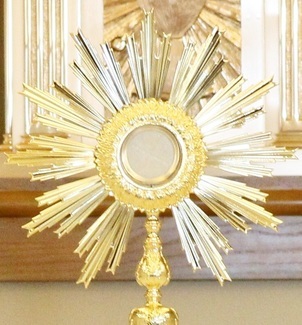 If the Pope himself would give you a special invitation to visit him at the Vatican, it would be nothing in comparison to the honor and dignity that Jesus himself bestows upon you with the invitation of spending one hour with him in the Blessed Sacrament. If you have any questions, please contact St. Mark Parish Office. I accidentally signed up for Thursday the 22nd, on the paper sign up.